← Phil Coke leads to victory and other oddities. The Tigers are going to the World Series. It started on Wednesday in a rain delay without rain and ended on Thursday in a screaming victorious Phil Coke glove slam behind the mound. The Tigers are going to the World Series. CC Sabathia was never the Sabathia that we feared, and came out of the game in the 4th. Max Scherzer struck out 10 over 5.2 innings. The Tigers are going to the World Series. Phil Coke pitched two innings to close out the game. Valverde and Benoit were warming, but neither was needed. Phil Coke owned the back end of the bullpen in the ALCS. The Tigers are going to the World Series. During the trophy ceremony after the game, Mike Ilitch stood there supported by Dave Dombrowski and Jim Leyland. The president of the American League said some dumb things, very poorly. Mr. Ilitch described the team as not having “one hot dog in the bunch.” The Tigers are going to the World Series. The offense finally decided to put in a decent night’s work. Miguel Cabrera homered. Austin Jackson homered. Jhonny freakin’ Peralta hit TWO home runs. The Tigers are going to the World Series. It didn’t rain even a little bit. The game was not at all delayed. The park was full. The cold weather encourages fans to show up in fuzzy costume tiger suits. The Tigers are going to the World Series. The Tigers beat the Yankees. The Tigers swept the Yankees. The Tigers are going to the World Series. The Tigers are champions of the American League in 2012. The Tigers are going to the World Series. This entry was posted in ALCS. Bookmark the permalink. Hey Sam, what do you think the Tigers are doing? 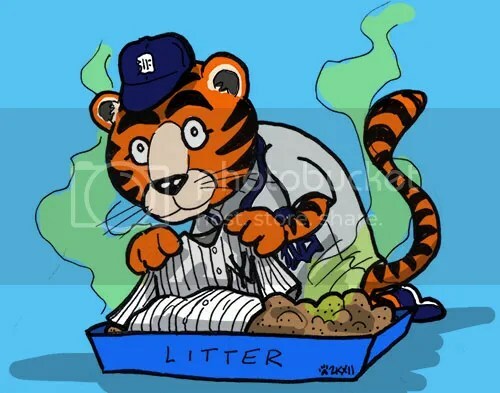 The Tigers are scratching litter over a Yankees jersey. But then… then, the Tigers are going to the World Series. Man, everything about this game was sweet for this neutral; can’t even begin to imagine how awesome it was for Tigers fans. Scherzer getting swinging strike after swinging strike. Cabrera’s super-bomb. Peralta’s second dinger, a laser beam neatly caught by the Tigers’ bullpen catcher. Comerica on its collective feet in the 9th, jammed to the rafters (um, metaphorically speaking), the perfect contrast to the half-empty Yankee Stadium. Prince waving everybody off really, *really* excitedly so he could catch the final out. Coke spiking his glove like it had turned into a leather demon and he was trying to kill it. Leyland telling everyone, including himself, not to drink too much tonight. Jackie Autry saying “M V Tree”. Delmon Young, ALCS MVP. Delmon Young. Delmon Young! Good luck to you guys in the World Serious. Make Paws proud. 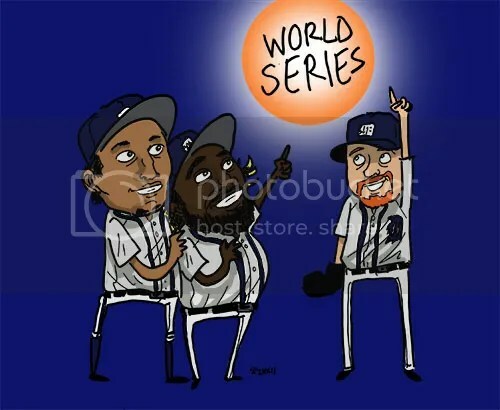 love this… all of it :) Except that I read, from the title to the end… “The Tigers are going to WIN the World Series.”!!! It does not get much better than this, although winning the World Series will be sweet. Go get em, Tigers! okay honestly this gave me chills more than another story i’ve read this morning. 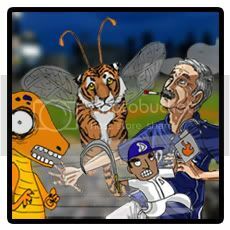 keep saying it till I believe it – the tigers are going to the world series!! I was at the game and it was glorious! Happy, stress-free pennant-winning viewing. I missed the epic Phil Coke Finger Point and glove slam since I was watching Prince. I have replayed it over and over again now that I am home. Epic! JBD, I am beyond envious :) Have fun! I am not a local – I live a 2-hour drive north – but I do know that many people do visit the corner of Michigan and Trumbull. Just an open field with a flagpole, but for many Tigers fans it is a meaningful place. If you have access to a car, or don’t mind an expensive cab ride, I would recommend the Henry Ford Museum. I’ve been there before and it is INCREDIBLE. Can easily spend the entire day there and still not see all the cars, motorcycles, historic RVs, trains, steam engines, etc etc etc. It’s amazing. Near the ballpark is Greektown, which is full of fantastic restaurants. I have never been to the Detroit Institute of Arts, but have heard from friends that it is also a great place to visit. And there is the zoo which I think has a brand new baby red panda. Just some ideas for Monday. One question: Are the Tigers in fact going to the World Series? C.C. wasn’t to be feared. The Yankees as a whole were never to be feared. If it were any other team, I might feel sorry for them, ’cause they couldn’tcatch a break all series long. However, they ARE the Yankees – so I don’t. I was at work Thursday night, but, fortunately, we had the game on. I wanted to break out into a happy dance SO BADLY when Prince caught that last ball. To maintain my professional demeanor, I had to contain myself to a “YESSS!! !” – but I was dancing inside. Sam, it took a while, but I’m pleased that my Giants are facing your Tigers.